The rat optic nerve head (ONH) is a segment about 250 μm in length extending from the funnel-shaped region where the optic nerve fibres (retinal ganglion cell axons, RGC) converge on the optic disc rostrally to the transition to the optic nerve (ON) caudally. The ONH has a characteristic kidney shape, some 500 μm wide and 300 μm dorsoventrally, with the ‘hilus’ of the kidney always at the midventral pole and occupied by two large vessels, the ophthalmic vein dorsally and the ophthalmic artery ventral to this. For complete orientation of the cross sections in space, therefore, it is only necessary to mark the medial and lateral edges at the time when the tissue is removed. The rat ONH contains only three tissue components—totally unmyelinated RGC axons, specialised astrocytes, and the endothelial cells of the microvessels which penetrate from the ventral to the dorsal surfaces. Unlike the human lamina cribrosa, there is no connective tissue, collagenous strengthening of the perivascular spaces. 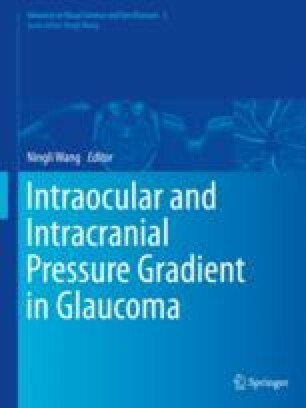 Since raised intraocular pressure causes RGC axon damage in the ONH of the rat, this indicates that the injurious effects of pressure transduction can be exerted in the absence of a connective tissue lamina cribrosa. Both structural integrity and function of axon are supported by astrocytes and microvessels. Astrocytes play the key role in the interactions of axons and microvessels. Rat ONH is a good model to understand the relationship of axon, astrocyte and microvessel in human lamina cribrosa (Fig. 19.1). The text and figures of this manuscript have appeared previously in our own work: Dai C, Khaw PT, Yin ZQ, Li D, Raisman G, Li Y. Structural basis of glaucoma: the fortified astrocytes of the optic nerve head are the target of raised intraocular pressure. Glia. 2012;60(1):13–28 . They have been used with permission and edited for this chapter.